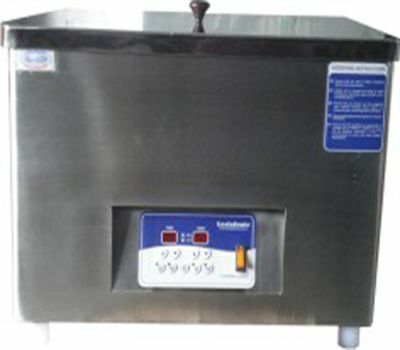 The company is a prominent Manufacturer, Supplier and Exporter of Ultrasonic PCB Cleaner in Mumbai India . Ultrasonic PCB Cleaner is specially designed to clean electronic PCB and spare parts of the circuit, remove dust, water or any kind of useless material of the circuit. Ultrasonic PCB Cleaner India, offered by us, is safe for electrical components and has fast cleaning action. Ultrasonic PCB Cleaning is microprocessor controlled, indigenously designed and manufactured in India as per the industrial set standards. Why Ultrasonic PCB Cleaner ? Thorough cleaning of PCBs after soldering always has been crucial to reliability of the finished product. Flux residue from the soldering process previously had been removed by rubbing the cleaning solution with the help of brush. 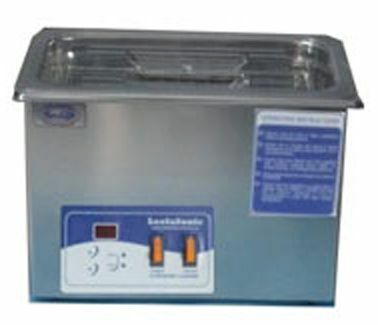 We have developed PCB Ultrasonic Cleaner for successful cleaning of through hole or SMD PCBs. Ultrasonic PCB Cleaning minimizes the use of hand and mechanical brushing in order to remove oxides from the printed circuits. The frequency beyond audible limit is called Ultrasonic Frequency. A normal frequency of 50 Hz is converted to very high ultrasonic frequency. Transducers, bonded to the bottom or side of the tank convert this frequency into mechanical energy. High intensity Ultrasound in liquid creates high & low pressure zones. Under the influence of low pressure period, microscopic bubbles get formed in vacuum form. These bubbles get compressed & eventually collapse & burst. This process is called "Cavitation."